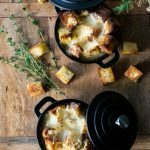 French-Onion Soup - What the Forks for Dinner? French-Onion Soup - What the Forks for Dinner? Melt butter over med-low heat. Add onions, salt, and pepper. Reduce heat to low. Cover and cook onions until soft and translucent. 30-40 minutes or until very soft…..do not allow to brown. Add chicken broth, wine, and thyme. Simmer for 15-20 minutes. Ladle soup into in safe oven bowls. Top with croutons and cheese. This is a personal preference so use as much or as little as you like. Broil until the cheese is melted and browning. Watch carefully as it can change from golden brown to burnt very quickly.